Yet the concept of extraterrestrial intervention in religion has strong roots and has been explored by many authors, using the Bible itself as a point of reference. Authors such as Mistaki, Le Poer Trench and Soviet astronomer Kazantsev suggest that angels could actually be ‘spacemen’. "According to Genesis 19:3 Lot took the two angels he met at the gate of Sodom to his house ‘and made them a feast, and did bake unleavened bread, and they did eat.’ But according to dictionary definitions angels are spiritual, ethereal beings. Angels who ate with Lot could not have been such beings … Rev. H. Wipprecht of Cobalt, Canada, says that the Bible’s description of angels fits ‘intelligent beings’ from other planets. Le Poer Trench notes other references in Gen. 18:4-5,8: "Let me bring some water for you to wash your feet; you can rest here beneath this tree. I will also bring a bit of food; it will give you strength to continue your journey. You have honoured me by coming to my home, so let me serve you. They replied, "Thank-you; we accept … He took some cream, some milk, and the meat, and set the food before the men. There under the tree he served them himself, and they ate." Le Poer’s belief in the extraterrestrial connection at times becomes tenuous, if not necessarily incorrect. He believes the following from Isaiah 13:3,5 is evidence that the ‘armies of God’ were an extraterrestrial expedition coming from space. "The Lord has called out his proud and confident soldiers to fight a holy war and punish those he is angry with." "They are coming from far-off countries at the ends of the earth. In his anger the Lord is coming to devastate the whole country." However, other puzzling images appear in medieval paintings that cannot be so easily dismissed. 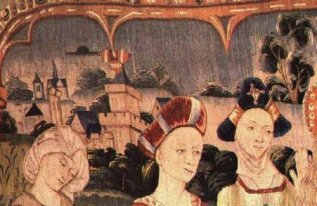 For example, in this scene (left) from a medieval tapestry portraying the life of the Virgin Mary, a black domed object can be seen in the background hovering above the skyline. Equally intriguing is the object hovering in the background of this segment of a Renaissance painting of the Madonna and Child. The object appears to be radiating beams of light. It is difficult to account for such an image by any other means except to accept that it is indeed a UFO. 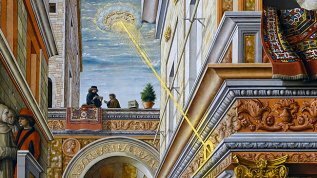 The following painting was executed for the Annunciation Church at Ascoli Piceno by Carlo Crivelli in 1486 (although some sources cite 1476). Saint Emidius was the patron saint of the city and in his hands the model of the church can be seen. More intriguingly, however is what appears to be a flying disc in the sky, also emanating a beam of light. Such strange phenomena continued to be observed throughout the centuries. On the 6th November 1896 the residents of Sacramento in California observed a light moving slowly across the night sky, apparently carried by a cigar shaped craft. Later in November a trolleyman named Charles Lusk made a further report that he had been standing outside his house and looking up at the sky when he saw a bright light cruising overhead. The craft was later spotted over San Francisco. Speculation mounted that the craft had been launched by a wealthy but anonymous inventor, and sure enough, in the winter of 1896 a lawyer who became known as ‘Airship Collins’ announced that he represented a wealthy by anonymous inventor who had assembled the machine in the hills north of Sacramento. So that was that, until a rival attorney claimed that it was in fact he who was the agent for the unknown inventor, and that two craft had been built, one in California and one in New Jersey. The purpose of the craft? To bomb Havana of course. This video documentary shows images of UFOs in religion and art. 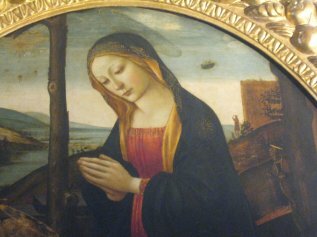 Pictures of UFOs have appeared in religion and art throughout the centuries. Of course the very basis of religions throughout the world is based on celestial bodies, so it is hardly surprising that many paintings depict aerial scenes and together with shooting stars, comets and meteors - unknowns to primitive man, we should expect a fair range of UFOs appearing in religion and art throughout the ages. However many of the images founds in cave paintings, renaissance art and other pictures throughout time, are not simply random drawings, but very detailed reconstructions of real images that have caught man's eye. This video documentary captures some of the best images of UFOs in religion and art across the world. Naturally, some will claim that the images are simply meteorites and other natural phenomena, however watching this video with an open mind makes that conclusion hard to justify in all cases. The Colony Free Press of Kansas had this explanation for its readers: "The Free Press … is now of the opinion that the airship is not of this world, but is probably operated by a party of scientists from the planet Mars, who are out, either on a lark, or a tour of inspection of the solar system in the cause of science." (20). Of course, the editor may have been mistaken …Then by May 1897 the reports ended as suddenly as they had begun.